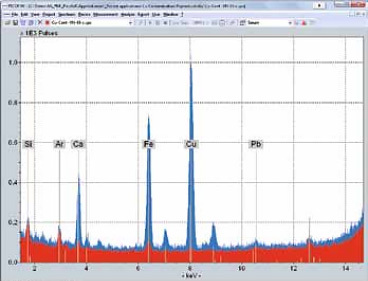 TXRF is a fast, simple and cost-effective alternative to ICP-MS, a technique commonly used for contamination analysis in laboratories. If you have any questions, or would like to know if this technique would be suitable for your application, please get in touch. Wipe tests are the most common technique for contamination control of laboratory surfaces and tools. Many laboratories use ICP-MS (inductively coupled plasma mass spectrometry) analysis, which involves digesting the wipes in acid. The Bruker S2 PICOFOX is a benchtop TXRF spectrometer. The instrument is equipped with an air-cooled low power X-ray tube (Mo target), a multilayer monochromator with 80% reflectivity and a liquid nitrogen-free XFlash® Silicon Drift Detector (SDD) with an energy resolution of < 159 eV (Mn Kα). This example looks at control of copper contamination – however, TXRF is extremely versatile and can be used for all types of materials. The production of high performance circuits involves the combination of copper thin films and low capacitance materials. Copper, with its low electrical resistance, is used in back-end-of-line (BEOL) processes for interconnect metallisation. It is important to avoid cross contamination in front-end-of-line (FEOL) processes. One of the key benefits of TXRF is its versatility. As well as liquids, you can analyse trace elements in solids, filters, suspensions, wipes and other kinds of samples. A Kim wipe tissue was spiked with 2 µl of a 1 g/l Cu standard solution, resulting in a total Cu amount of 2 µg. A small part (about 0.5 x 0.5 cm) of the spiked tissue area was cut out, placed on a quartz glass carrier and fixed with a thin film of Silica grease. A blank tissue was also analysed for comparison purposes. The results of the exclusion test measurements are shown below. The red spectrum represents the blank sample and the blue spectrum is the sample spiked with 2 µg Cu. Using TXRF, contaminations in this concentration range and below can be controlled easily. As you can see, the technique has also detected additional elements including Ca, Fe and Pb. This was caused by contamination during sample preparation, which was not performed in a high grade clean room laboratory. To test the reproducibility and accuracy of TXRF quantitative analysis, 10 tissues were spiked with 50 µl of a Cu standard solution (Merck, 1 g/l), along with one blank tissue. In a thoroughly cleaned glass beaker, the tissues were treated with 50 ml of ultra-pure nitric acid for 5 minutes in an ultrasonic bath. 500 µl of Ga solution (1 g/l) for internal standardisation and 500 µl of Ge for control purposes were added before starting the ultrasonic treatment. 10 µl of each extract were prepared as triplicates on a quartz glass carrier dried in a desiccator and measured for 1000 seconds. The blank corrected results for the Cu content are displayed below. The mean value for Cu has been determined at 52,5 µg, which corresponds to a value of 5,0 % relative deviation from the nominal value. Measurement 5 was excluded from evaluation. The overestimation of this analysis was caused by an error during the addition of the internal standard. This was proven through the control element Ge, which showed a similar overestimation. 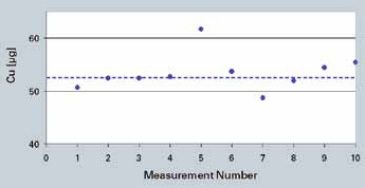 The relative standard deviation of the measurements, mainly influenced by sample preparation and instrument stability, is 6.6 %. The method limit of detection, calculated for a confidence level of 99.9 % with a student’s t-value of 2.896, is 5.8 µg. Calculating the lower limit of detection through the concentration, peak and background intensities according to the equation given by Klockenkämper results in a value of 0.2 µg. TXRF analysis using the Bruker S2 PICOFOX is a fast, simple and cost-effective alternative to techniques such as ICP-MS. It is an easy technique for fast sample screening, with little effort and cost. TXRF detects multiple elements simultaneously, so it detects all contaminants in a single run. Blue Scientific is the official UK distributor of Bruker TXRF. As mentioned above, the technique is extremely flexible and can be used for a wide range of applications. If you have any questions, or to discuss the most suitable analytical method for your work, please get in touch.